Кемпинг Santa Marta находится в Кульера, Вале́нсия, расположен по морю и В лесах. Это Кемпинг, снабженный террасой и Кемпинг со скошенной поверхностью предлагает местa Выделенные, в тени, Без тени и Площадки с небольшим количеством тени. Camping Santa Marta расположен вблизи Песочный пляж. Предлагаются в аренду Бунгало. В кемпинге есть Спортивная площадка. В кемпинге есть Открытый бассейн и Бассейн для детей, начинающих ходить. В окрестностях кемпинга можно купаться в Море. Не обязательно всегда самим готовить пищу: В кемпинге есть Столовая, Пиццерия и Ресторан (закуски) aanwezig. В кемпинге можно купить Свежий хлеб. Можно выходить в Интернет, так как У Вас будет доступ в интернет через Ваш ноутбук в 80% кемпингов. Этот инспектор посещает каждый год Кемпинг Santa Marta и проверяет кемпинг по более 200 элементов инфраструктуры и услуг и другим критериям.Инспектор является сотрудником ACSI и не имеет никаких обязательств перед кемпингом. This site is very hilly, the men's toilets/showers are on 2 levels, with toilets on the top level and hand basins/showers on the lower, however if you wish to use them at night take a torch as the auto lights go out very quickly and you can't see a thing, you have to hold the side of the wall and feel your way down stairs to wash your hands (very dangerous). Whilst we were their the supermarket, café/bar was not open. There was also a lot of work going on drilling/banging/sawing as it seemed the site were putting more lodges on. Although there are toilets and showers for the disabled I would not recommend this site due to its steepness and varying levels. I have knee problems and found it very hard. Also if the shop on site was open their are approx. 12 steps up to it (NO RAMP) and the café/bar approx. 6 steps. Having said all that the staff at reception were nice, but the best of all is only a couple of hundred meters across the road, a beautiful bay with a long flat promenade and a great sandy beach, if you can forget the tall buildings the town is very nice. We visited this campsite twice during our 6 months touring. It is not a pretty site and quite shut in but the pitches are hardstanding with electric and water on each pitch. The staff are helpful and friendly, many speaking English. It is an easy walk to the seafront/sandy beach - you can walk for miles. The showers were hot and spotless. The town is spoilt by the many high rise flats and apartments but there are lots of nice little bars offering menu del dia etc. The staff are helpful and friendly - The facilities on the outside look dated but the showers are hot and powerful, and all are spotlessly clean - some of the best we have had over our many years of touring. The pitches are a good size but lots of trees, useful in the summer but difficult to find a sunny one when leaves still on the trees. Even so we would recommend this site - The beach is only a short walk the town a little longer. Very nice town though lots of high rise. As was mentioned on another review a very Spanish town, not many Brits spoiling the place. Excellent site we will hopefully retun. Pasamos un fin de semana genial en este camping, el personal muy amable y los servicios muy pero que muy limpios, aunque al estar fuera de temporada no pudimos entrar a la piscina ,tiene muy buena pinta y seguro que en verano volvemos,aunque eso si,echamos de menos el supermercado en el camping, puesto que estaba cerrado, por lo demás un diez. We were a little hesitant to give this site a visit due to the lack of reviews. However we were pleasantly surprised to find that it was a very good site in an excellent location. 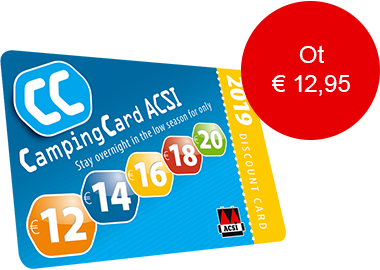 The site offered ACSI rates. The site is positioned on a hill with good terraces, the main parts were well shaded but there were small sections in the sun for those here out of season. Although parts of the site were a little untidy the facilities were excellent. This is a typical Spanish campsite in a resort that seems to cater more for Spanish people. There were no English bars competing for the cheapest pint or ‘all day English Breakfasts’. Despite the numerous large apartment blocks we found this to be an attractive resort with a lovely pedestrian waterfront that stretched for about 3 miles. It's what Benidorm could have been like if it had not gone down the Blackpool Golden Mile approach to tourism. Хотите забронировать место в кемпинге Кемпинг Santa Marta или Вам нужна дополнительная информация? См. информацию ниже или собственный интернет-сайт кемпинга. ACSI Eurocampings переправляет ваш запрос информации в "Кемпинг Santa Marta".